Kansas City has ideal conditions to lead to foundation challenges. The contributing factor is the high clay content in our soil. Because of this, they are often classified as “expansive soils,” in that as the ground gets wet, the clay absorbs the water (much like a sponge) and expand. Similarly, when it dries out, the soils contract. This leads to a cycle of expansion and contraction, not only impacted by wet and dry weather, but also by warm and cold. As you can imagine, the weather in Kansas and Missouri facilitates fairly dramatic swings between the extremes of weather. All of this, of course, leads to pressure on basement walls. A cubic yard of dirt weighs about as much as a car, and there are many, many yards of soil surrounding the walls of your home. It’s a lot of inward pressure (technically it is called hydrostatic pressure). It pushes on walls, and leads to leaning, bowing, and cracks. Cracks lead to water intrusion. At Foundation 1, we have a number of “tools” in our toolbox for designing a customer repair plan for your home or business. One of those is the concept of load reduction and allows us to reduce that hydrostatic pressure on your home and waterproof from the outside. The process starts with digging out the impacted walls. We excavate about 3 feet out from the foundation wall all the way down to the footer, the entire wall of the foundation. With the dirt removed, if the walls need to be straightened, we use a series of steps to get the walls back into alignment, or plumb. This then allows the house to rest on the top of the foundation walls, per the original design. As you might imagine, we have seen a number of walls that were significantly out of alignment, including to the point of full breakage. When it gets to that point, the home is at risk and we have to rebuild the walls, literally in an effort to save the home. Luckily, most people do not let it get to that point before getting the proper fix in place. While the outer foundation wall is exposed, this gives us an opportunity to replace damaged concrete and fill in cracks, both from the inside, as well as from the outside. After straightening the walls and fixing the cracks, we apply a waterproof membrane to the outer surface of the foundation wall. After applying this membrane, when water hits the surface in the future, it will roll down the wall, rather than penetrating the wall. While the foundation wall is excavated, we also replace the footing drain. In most older home, the original drain pipe is either not present or clogged, which allows water to accumulate. With a new drain pipe in place, the water has an ability to drain away from the foundation wall. When we go to backfill the excavation, we replace the dirt largely with gravel. This is significant for the reducing the load placed against the home, as gravel does not expand and contract to the level that dirt does. It also create a situation that water approaching the home immediately drains down to the drain pipe at the footing of the house. When installing such a system, we ensure the drain pipe either drains to daylight OR (more commonly) that we connect the drain pipe to the sump pump, which then helps pump the water away from the home. Central to this approach is to address the problem at its root cause. 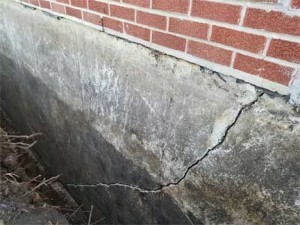 Too many foundation repair and waterproofing solutions address the symptoms and not the cause. Foundation 1 takes extra care to ensure its repair plans address the underlying issues, which hits the issue at the cause, not just putting on a Band-Aid. Learn more about how a load reduction system can help protect your foundation from damage and from water intrusion in your home or business. Call us today to have a free evaluation of your property, where you will be provided with a repair plan and estimate.